It’s hard to miss a van Gogh. 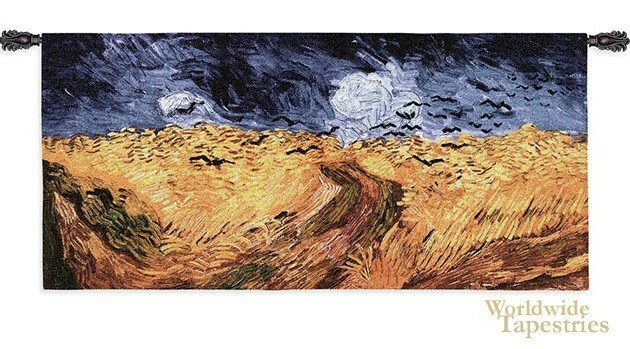 "Wheatfields with crows" is undoubtedly one of Vincent van Gogh’s most often debated paintings. Some see it as his suicide note put to canvas while others say it invokes a simpler, more positive theme. Still others see it as a history of van Gogh himself. The sky is thought to represent his early works, the field his life, and the crows the foreshadowers of his own death. No matter how you interpret it, "Wheatfields with crows" is one of the great works by this master. The intense use of color and energetic brushstrokes are simply stunning and you will love having this classic in your own home. This tapestry "Wheatfields with crows" is true to the original in every way and has a tunnel for easy hanging. Note: Tapestry rod and tassels, where pictured, are not included in the price. Dimensions: W 54" x H 26"